Camiguin Island, Philippines -- Come as you are. If you want to know where these places are located, please see the Camiguin Island Map. The red spots on the map would indicate the scenic places for you to visit. The devastating volcanic eruption in 1871 wiped out the Spanish settlement of Catarman that was established in 1697. The remains of an Old Spanish church, ruins of adobe walls, belfry and convent are mute witnesses to the wrath of nature. It also allows us a glimpse into the culture of Spanish-era Camiguin. A man-made lagoon located in Benoni, Mahinog. Its mantle of limpid waters, craggy cliffs and huge boulders standing like sentinels, gently rolling hills with peaks covered by creamy clouds and a perpetually restive sea provide visitors with a sense of serenity and peace. Truly a place to convene with nature. 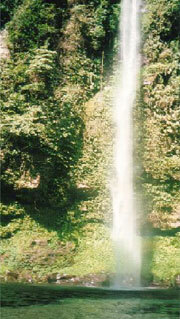 The 250-feet majestic beauty cascades to a rock pool surrounded by ground orchids, wild ferns, trees and boulders. Its ice-cold waters provide an ideal summer splash to locals and tourists alike. Rock picnic tables, seats and cookout facilities are available for use. The trek to the 25-meter high strong waterfalls is fun and exciting. One will have go through a very scenic hike passing through the quaint barrio Mainit before being refreshed under the thunderous falls. A volcanic spring by the sea. Water temperatures turn cold, hot and lukewarm as the tide changes from high, low and medium, respectively. Diving is good to about 1020 meters in a gradual drop off. It is an ideal site for scuba diving. Located in Mahinog, the Macao Cold Spring is one of Camiguin's idyllic springs. One will be amazed with the cool splash of crystal blue-colored water. Swimming along the pool, one could be accompanied by a school of small fishes. Huge century-old trees surround the pool, keeping it cool and shady. Three kilometers off the shore from Barangay San Roque, Mahinog is an island four hectares of evergreen forest fringed with sandy beach. The boat ride to Mantigue is quite exciting, as one has to contend with strong diverging currents due to the open sea. One side of the island is ideal for swimming as it is shallow and has few corals. The opposite side is a deep drop off ideal for snorkeling and diving. The only active volcano in the island, the 1250-meter slope is a challenge even to the seasoned mountaineer, as he has to contend with loose rocks and boulders. Mount Hibok-Hibok has a crater lake at the peak and has steam outlets abound. 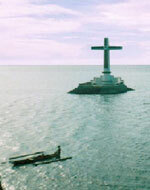 The peak also offers a breathtaking view of the islands of Cebu, Negros and Bohol. A unique underwater lave formation is the main attraction in this site that rises from the depths of more than eighty feet from the bottom forming a series of pinnacles. The coral covered molten rocks are surrounded with tropical fishes such as anthias, clown fishes, damsels and the like. The local hot spa is a natural pool of about 40 degrees centigrade springing from depths of Mount Hibok-Hibok. The Municipality of Mambajao has provided cottages, restaurant and dormitory facilities that cater to local and foreign tourists. It has picnic huts, cookout facilities and restrooms for visitors.It is ideal for night swimming, a place to rejuvenate both mind and body. The seabed rises forming a shoal of about ten hectares in size. The Jicduf Shoal is one of the best diving spots in Camiguin. It offers a wide variety of aquatic life for the diver to observe and enjoy. It is an ideal site for underwater photographers and novice divers. A favorite spot for high-adventure-seeking divers, the Burias Shoal can be reached after breezy thirty-minute speedboat ride. One can find schools of jacks, tuna, surgeons, mackerel and barracudas. The shoal boasts of a lush black coral covered bottom. Strong currents may make diving tricky, however, the experience is worth the effort. Located in Catarman, the Sto. Ni�o Cold Spring has a pool measuring 25 meters by 40 meters. It is 2 meters deep of cold spring water sprouting from the sandy bottom. The area has a restaurant, native cottages, picnic huts, cookout facilities and restrooms for visitors.